Guys, the IMPOSSIBLE has happened. I made my first pair of pants; JEANS! And they FIT! Somebody hold me, because EMOTIONS. I've been sewing for nine years now and have amassed quite the collection of dresses and jackets. Pants however, have not even made it into my pattern collection let alone under my sewing needles because TOO HARD. I'm 5'4", bottom heavy and pants just seems like an inevitable fit-issue nightmare. The desire was there though friends, brewing away, until it got to the point where I just couldn't stop thinking about it. Enter the new Megan Nielsen pattern, the 'Ash Jeans'. With FOUR different leg versions; slim, skinny, flare and wide leg, this pattern is a giver. is made with stretch denim. The instructions for this pattern were exceptional, I mean actually flawless. Being a complete novice at pants I depended on the instructions. Every question I had was answered and explained with zero assumed knowledge. You could tell that Megan really took the time to make sure nothing was left out and obviously pays attention to her testers. 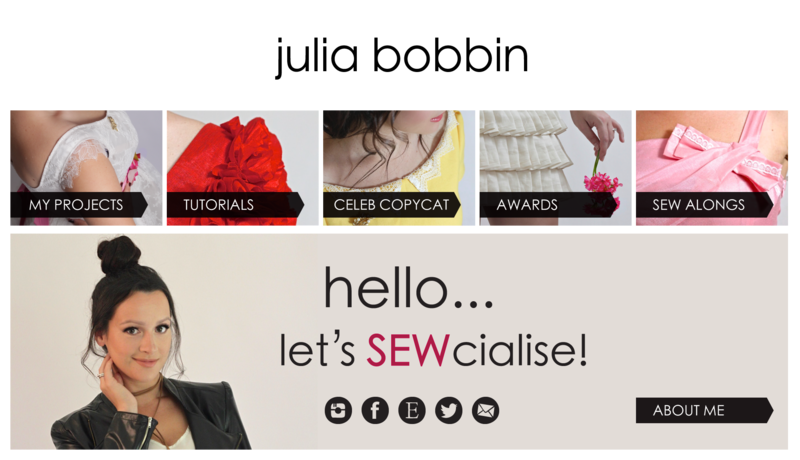 There is also a wonderful and thorough sew-a-long on her website which I also utilised. I made the skinny leg (version 2), cutting out the 29 and grading up to a size 31 on the hips (widest part of the pattern). I actually measured a size 29 on my waist and a huge THREE sizes bigger on the hips. Help! I only graded the hips up two sizes as I figured the stretch in the fabric would forgive the size variance. I ended up taking the hips and the legs in quite a bit. See changes below for details. This denim has 2% Elastane which gave about 15% stretch. It was nice and strong but still soft and comfortable and I love how well they turned out! Despite my hips measuring three sizes bigger than my waist, I ended up taking in each leg from the hips down by a few cm's. I wanted a real fitted 'skinny leg', and the stretch in the fabric allowed for a tighter fit. I also adjusted the waist so that it was more of a size 28 in the end. I added my own leather patch to the back waistband, and that little extra detail really makes them look like an official pair of jeans! I used the triple-stitch feature on my sewing machine instead of using embroidery thread for all those rows of top-stitching. There is a lot of top-stitching done through this pattern, so not having to constantly change thread was a huge time saver. I increased my stitch length to 2.6 to combat the thicker fabric. One of the things that has always scared me about jeans, is the rivets and buttons. Turns out they are way easier than they look. What I found the most overwhelming was knowing what equipment to get. I ended up buying a hardware kit from Megan's website and it came with everything that I needed for this pattern. The hardware makes the jeans look authentic and they also have purpose! The rivets are placed on areas that need reinforcement; areas that are susceptible to being pulled apart or strained through regular use, such as pockets. I don't know what it is about the little coin pocket at the front but it makes me happy. I mean, it's just so cute and practical and jeans-y, you know?! I made my pockets out of remnants of this cute New York print fabric. This fabric featured as lining in my first ever blog post here. Awwwww. The height of these jeans is just right on me. It holds me in without being uncomfortable and doesn't bunch up under tops. These pants were my toile and amazingly I was able to make the changes as I went, without having to cut out new pieces. I did however buy double the amount of fabric in the assumption that they would not be wearable and that I would need to make a second pair once I had the right fit. 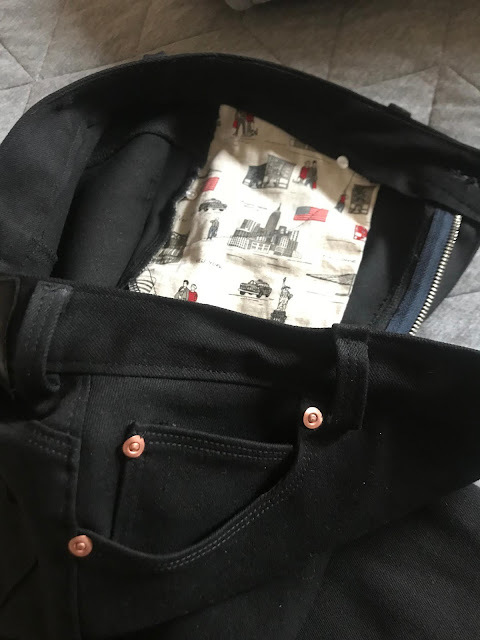 Denim and stretch can vary so much depending on the fabric, so where possible I highly recommend you make your toile and your finished jeans in the same fabric. It would be so frustrating to get the fit right only for it to not work when you make it in another fabric. I still can't believe I've made my first pair of pants AND that I love them! All these years I've put up with ill fitting pants or avoided them completely. Now I have my very own pair that fit how I want AND I MADE THEM MYSELF! Is this real life??!! Being curvier from the waist down means the fit has to be right to make the pants look flattering. These aren't perfect, but they fit well and it is so satisfying to know that it can be achieved. I've only just ventured into fitted pants too. A wide/straight leg version of these jeans might be just what I need to make - thanks for the pattern alert. They’re fabulous! Just curious how you worked out your stretch percentage? Fabulous jeans! I was so keen to read your story as pants are high on my make list for 2018 and we're fast approaching its end! 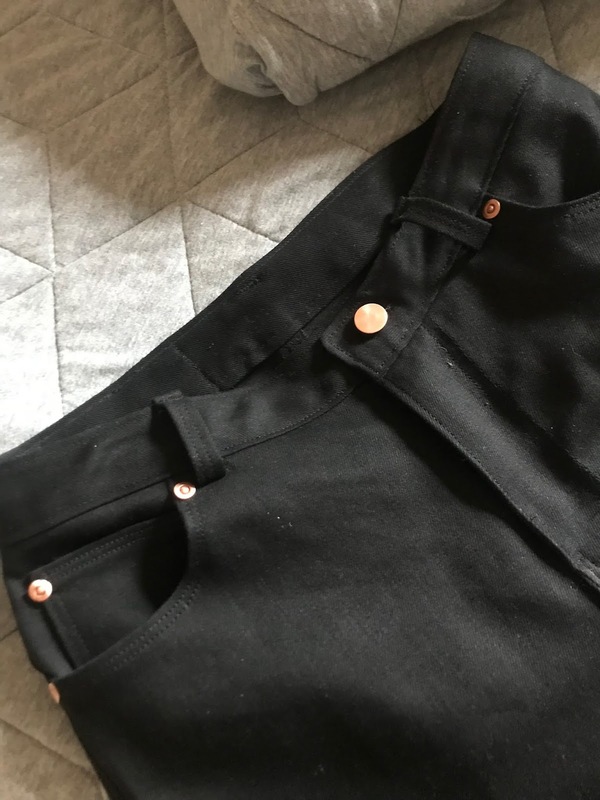 I've signed up to take an inperson class with Alexandra Morgan (she has youtube fitting videos that are fantastic) to make a pants sloper which I'm really excited about! 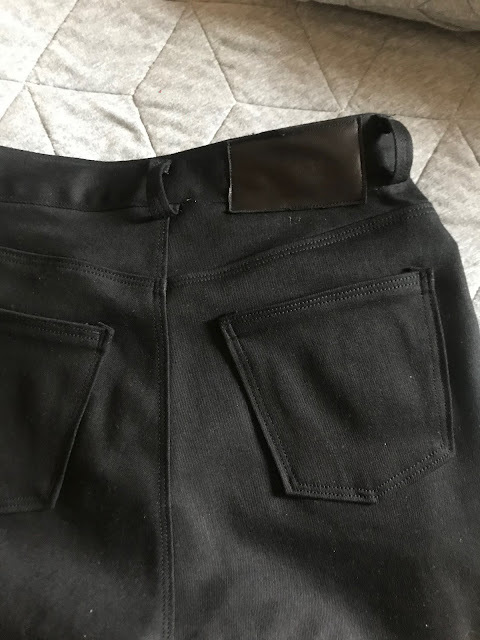 I'm sure once I have my sloper I'll feel more confident getting out those pants patterns I've been saving to start making myself great fitting pants/jeans like yours! Congratulations on reaching this milestone :) I hope to be right behind you! Your measurements are almost identical to mine and you have given me courage....!I am going to do it! I LOVE making jeans! They are some of my favorite things to make. Yours look AMAZING!!!! Great tips also. Be blessed. Congratulations, Julia! You knocked your first pair of pants right out of the park! They look great. They look so amazing Julia! I’m terrified to sew pants - dodgy cotton round the place shorts but actual pants...argggh! But your upbeat post and fabulous jeans might have helped me feel a little less terrified!